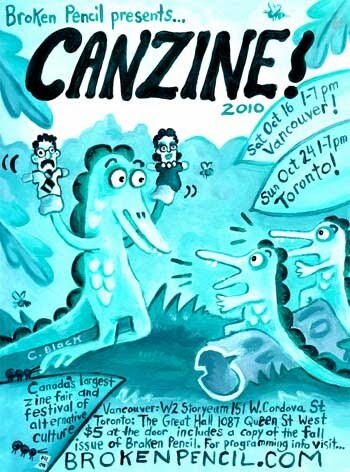 I will be displaying my wares as a vendor at Canzine tomorrow afternoon, Canada’s largest zine fair & festival of alternative culture. The festival has a focus on indie publishing & though I’ve never published a zine myself, I’m frequently asked if I’ve ever thought about illustrating a children’s book. I spent much of my childhood with my nose buried in my favorite books, so of course I would love to create something that new generations of children enjoy. Unfortunately, the publishing world is tough nut to crack, so I’m particularly excited about the surge of indie publishing. I can’t wait to see what’s new at Canzine! Guests of the festival will be able to peruse zines, magazines, books, art, crafts, and can listen to readings, watch poetry collide with improv comedy, view art exhibits and installations, create art with Collage Collage, buy handmade goods at the Got Craft mini market (that’s where I’ll be! ), watch indie film shorts, pick through vintage treasures, and more.